TUA 1. What inspired you to start Solepack? SP: The inspiration behind the creation of Solepack was basic necessity-A need to travel more efficiently and practically with my kicks. To go into it further, I was a big bball gym rat, studying to be a physical therapist and always traveled with my hoop shoes tied to my backpack or dangling from my fingers with a plastic Footlocker plastic bag. I commuted from Staten Island to NYU daily and I just needed a better way. I looked all throughout NYC for an accessory bag that let me pack my kicks directly onto my backpack but there wasn't! So I decided to create one myself. And here we are 16years later!! TUA 2. Could you please briefly explain the creative process that you go went through when coming up with the Solepack new bag design? TUA 3. What’s it about your products that are unique? SP: As mentioned, our signature & mission is to innovatively keep kicks separate from your clean goods. We feel our products have more functional elements considering our backgrounds in physical therapy. They are specifically designed to help us function in our environments-urban or outdoor. Also, growing up in NYC in the 90s, there was so many influencing factors on us and has influenced the product as well- from basketball to hip hop to skating to travel to running. We feel the product and company uniquely embodies our journey in life and is a perfect blend of fashion, function, and fitness. TUA 4. Has the sneaker culture influence your design? SP: The sneaker culture has definitely influenced our design. Being from NYC & growing up around the basketball and hip hop scene, sneakers culture was always a natural element. Particularly with our SP-1 and the actual construction of the bag, we had sneakerheads in mind as we sought to provide maximal protection for your kicks. We made its double layered with water resistant fabric to ensure your kicks are well maintained during the worst of weather. There are also strategically placed vents by the mouth of the shoe to keep your kicks crispy. TUA 5. What’s the best advice you ever got? SP: I'm always a very positive person and feel I always receive that positive energy back. BUT I'd say the advice that has had the most impact was advice guiding me in a direction I didn't want to go in. A few times some folks have advised me to forget about the cultures & grassroot communities we're organically connected with. They'd say just make these bags as cheap as possible and sell them to the masses and take your profits. Call me a bad business person, but it means so much to me to connect with these passionate communities and work with them and allow us to inspire one another and lift each other up. That's the ethos of our being & company. TUA 6. What are some specific, user-friendly details that make Solepack bags ideal for travel? SP: Our products make traveling with your kicks an easier & more cleanly experience. Whether your trip is short and quick or for an extended journey, our bags will pack your kicks like never before. Our GRF shoe storing string bag is a drawstring bag built like no other. 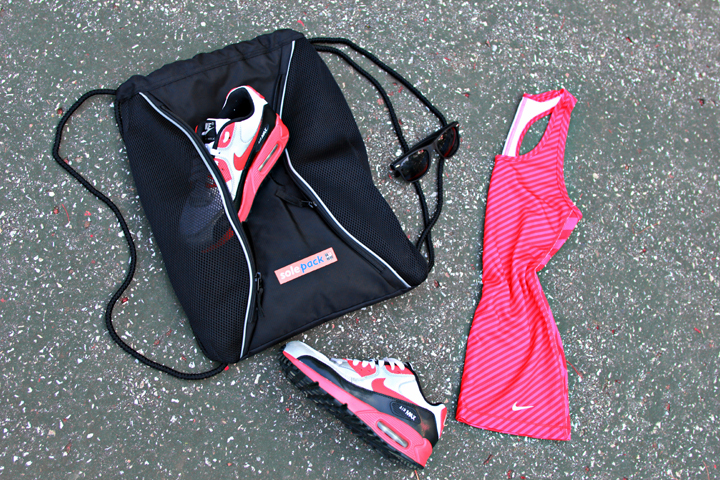 Its separate shoe pockets keep your dirty athletic shoes away from your other clean workout gear. Perfect for your short trips to gym or field! Our patented SP-1 shoe accessory bag essentially creates more storage room for your kicks. It conveniently wraps around any backpack and your shoes will never take up room inside your pack again. A much needed upgrade to having your shoes dangle on your backpack as well. For those heavier packing days when you run out of room in your pack, our SP-1 will always provide a separate space for your kicks! TUA 7. What can we expect from Solepack in 2017? SP: Currently, we continue to be excited to develop our relationships with the urban athletes globally & locally and also have begun sponsoring elite athletes as they prepare for the Olympics in Rio as well as the NYC Marathon. In late 2016 and throughout 2017, we will continue to provide line extensions of our existing products, introduce a few more products that keep our signature shoe storing designs, and continue to forge relationships with brands just share our same vision.